The aurochs (Bos primigenius), the ancestor of domestic cattle, is an extinct type of large wild cattle that inhabited Europe, Asia and North Africa. The Pleistocene aurochs was the largest species of bovines that ever lived, and in a slightly smaller form the species survived in Europe in the Holocene until the last recorded aurochs died in the Jaktorów Forest, Poland in 1627, but most examples found in the fossil record are from the Pleistocene era. The aurochs was one of the largest herbivores in postglacial Europe, comparable to the wisent, the European bison. The size of an aurochs appears to have varied by region: in Europe, northern populations were bigger on average than those from the south. In Northern Europe during the Holocene, aurochs had an average height at the shoulders of 155–180 cm (61–71 inch) in bulls and 135–155 cm (53–61 in) in cows. In body mass the aurochs is comparable to the wisent, reaching around 700 kg (1,500 lb). Pleistocene bulls were even bigger at 240 cm at the shoulders (95 inch). Most of the aurochs fossils in which we deal are from the Pleistocene period and their average age is around 100,000-40,000 years. Because of the massive horns, the frontal bones of aurochs were elongated and broad. The horns of the aurochs were characteristic in size, curvature and orientation. They were curved in three directions: upwards and outwards at the base, then swinging forwards and inwards, then inwards and upwards. 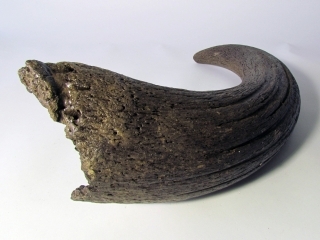 Aurochs horns could reach 80 cm (31 in) in length and between 10 and 20 cm (3.9 and 7.9 in) in diameter; the span of Pleistocene horns could be over 200 cm (79 inch). The horns of bulls were larger, with the curvature more strongly expressed than in cows. The horns grew from the skull at a 60° angle to the muzzle, facing forwards.